Prepare for another terrifying adventure in Konami's twisted town. If something doesn't work, the best thing you can do is retrace your steps, find out what went wrong and correct your mistake(s). That's what Konami has done with Silent Hill. The survival horror series started out strong, but over the years, it kind of lost its way, coming to a near-halt with the merely above-average Silent Hill: Homecoming. Thankfully, with the help of Climax, the franchise is back on track with the bone-chilling Silent Hill: Shattered Memories. We dare you to play it with the lights off. 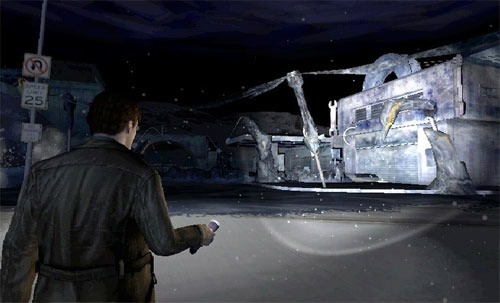 In the game, Harry Mason is driving with his seven-year old daughter Cheryl, when he suddenly loses control of his vehicle on an icy road. He comes to, seeing his car in pieces and realizing that his daughter is nowhere to be found. Armed with only a flashlight, Harry heads into the creepy town of Silent Hill, where reality is constantly in question. The abnormal characters he runs into don't add up, and then there are the weird supernatural creatures popping out of the ground, constantly trying to drag him into the darkness. 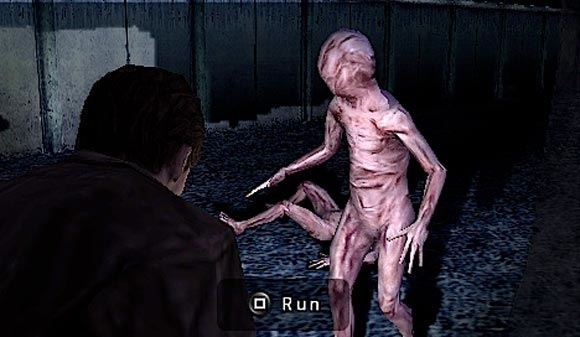 Like previous games, Silent Hill: Shattered Memories is very weird, but it's also terrifying. Harry isn't an action star by any means, so he can't clobber an enemy or shoot it like the much-stronger cast members of Resident Evil. When he gets into an encounter with one of these beasts, his only option is to run. This leads to the game's terrific chase sequences, where you'll have to act quickly or risk being captured. Now, if by chance you are caught, you start from the beginning, so you can try your luck again. It's mildly frustrating, but it certainly beats getting a "game over" screen and not being able to explore any further. Silent Hill: Shattered Memories does away with the series' more tedious moments, as you're always in search of something or evading trouble. This pace keeps you involved, even if you're solving what seems like a bizarre puzzle. The character actions are equally interesting, as you'll question who's got their head on straight and who doesn't. If that's not enough, the game also takes a break with psychological mini-games, where an interviewer asks you questions regarding your play experience. These are actually cool, as the game changes its dynamics depending on your answers. On the other hand, if you're a player who's not emotionally stable or gets spooked easily, this might be too much. As for controls, you'll execute actions with ease, such as shining your flashlight in specific directions or looking for hidden items. Furthermore, you won't get stuck during the chase sequences; kudos to the developers for keeping things moving. Climax could've easily leaned on the game's psychological element and ignored the presentation, especially on the PSP. Instead, the company went all out in this department. The visuals are excellent throughout, with a near-perfect use of shadows and lighting. The character design is equally good, whether you're dealing with humans or monsters. As for the music, it's typical Silent Hill, with chilling melodies and effects. Unfortunately, there are some issues. It only takes about ten hours to beat the game. Furthermore, there's constant loading, particularly when you're going through doorways into new areas. However, Shattered Memories is the best game in the series in quite a while, and perhaps a precursor for better things to come. Grab a copy, turn out the lights and enjoy. What's Hot: Outstanding atmosphere, intense chase sequences that force you to act quickly, terrific gameplay interactions, psychological tests help shape your experience. What's Not: Not much action, ends too soon.